In the past 20 years I have seen the number of different HGH products grow from only eight, and our original HGH formula was one of those original eight, to hundreds of products being sold online! I regret to say that as the human growth hormone industry has become more and more competitive so too has the number of false claims and sales hype being used to try to sell such products increased. Most everyone says they offer the best HGH product available, and they give a reason why it is best. However, what is important is whether they can offer any clinical evidence to support their claims. Growth hormone in the body is measured by a lab blood test called the IGF-1 test. The only way to actually prove which product is most effective is to do proper independent randomized double-blind placebo-controlled IGF-1 level testing on test subjects taking the product. However, most products on the market have not had their products tested this way. Since most products haven't had any real clinical testing for effectiveness sellers must come up with other reasons why their product is best and why you should choose it. 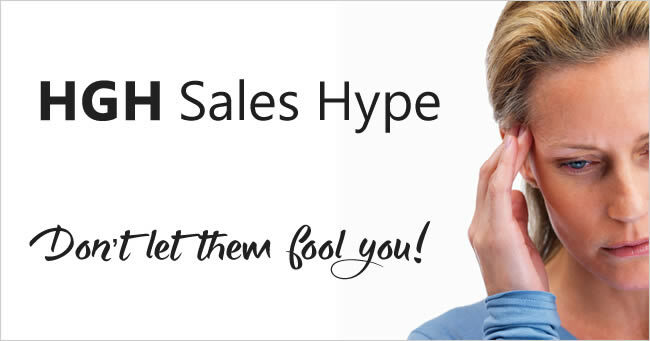 Below are some of the most common false claims and hype that competitors may use to try to convince customers to purchase their product. *Please click on each link for more information about that specific claim. Lisa Wells, RN - working with human growth hormone therapies since 1999. Fake Consumer Sites - web sites that masquerade as independent HGH consumer web sites and claim to have reviewed and rated the various products on the market and they purport to tell you which is best. Some selling HGH gels claim their product works but the sprays do not. Some use hype such as the claim that their product contains the most nanograms of human growth hormone. Example: 30,000 ng. Some claim their product contains HGH that is not homeopathic. Some claim that the HGH patch or topical cream they offer is better than sprays. The false claim that only the injections are effective is made by some sites which try to sell the injections illegally online and sadly also by some clinics and doctors who prescribe and sell the injections right inside their clinics/offices. The false claim that sprays are not effective is made by those selling the pill products and by some clinics who sell the injections. They also like to make the false claim that homeopathy is not effective. Some who sell the pill or powder products that contain no form of human growth hormone claim that products that do contain HGH may cause mad cow disease. Some claim that only their product is FDA approved. Some claim to offer a no risk 90 day 100% money back guarantee. 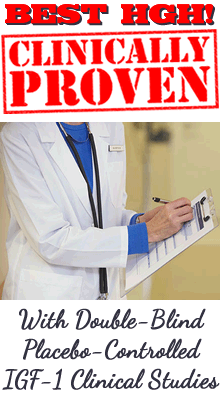 Some make false claims about clinical studies done on their products. Some claim that their product is better because it contains a special polymer matrix or other type of delivery system that nobody else has. Some sellers of the pill or powder products claim that you should not take any spray that contains alcohol. Some who sell sprays claim that only their product contains all 191 amino acids. *Information about these last 4 false claims is found at the same link as the alcohol claim above. Some who sell sprays claim that the color or type of bottle they use makes their product better. Some claim that any product that contains human growth hormone will make the pituitary gland lazy. Some claim that theirs is the only product that blocks somatostatin. The above claims may seem very convincing when you read them at the company or distributor's professional looking web site but none of these claims are true so please do not choose a product based on any of the claims above. *Only randomized double-blind placebo-controlled IGF-1 clinical studies can measure the real effectiveness of any HGH therapy by measuring the increase of the growth factor IGF-1 in the blood of test subjects and so look for products that have independently done clinical studies. IGF-1 Clinical Studies Measure Real Effectiveness.